#TeamSpeck is hitting the streets to see who’s picking up their brand new Samsung Galaxy S6 or new Galaxy S6 edge today. And no surprise, we’ve got a lot of happy Speck fans who are walking out of stores with their new smartphones safely wrapped in one of our super-slim, super-durable cases for Samsung Galaxy. Of course, we haven’t forgotten about HTC! We’ve got our award-winning CandyShell Grip for the new HTC One M9 available today in four brilliantly bold colors that will give your new HTC military-grade protection in addition to second-glances on the sidewalk. 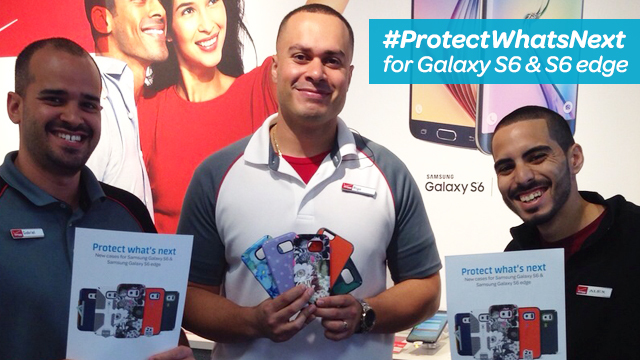 No matter what your style is, we’ve got you covered in slim, engineered protection for your new Galaxy. Plus, this is our largest selection for Android at launch ever with over 30 military-grade protective designs to cover your new Samsung Galaxy. If you like to show off your style with stunning, high-res, wraparound graphics, take a look at our CandyShell Inked for Galaxy S6. For a different kind of smooth, sophisticated style, go with our classic (and best-selling) CandyShell for Galaxy S6. And for the extra clumsy, shop our MightyShell for Galaxy S6 and MightyShell + Faceplate for Galaxy S6 – our most protective smartphone case to date. Finally, to get the best hold on the unique design of the new Galaxy S6 edge, shop our CandyShell Grip – the perfectly protective Galaxy S6 edge case that features raised rubber ridges to prevent your phone from sliding on slippery surfaces. Learn more about our Samsung Galaxy S6 cases and Galaxy S6 edge cases by visiting our FAQs here. As always, stay tuned for new colors and designs coming out soon!